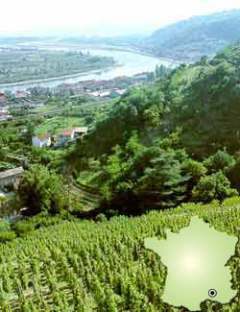 The Rhone River begins its 250 mile journey high in the Alps of Switzerland and divides the wine regions of France’s Rhone Valley before reaching the Mediterranean Sea. It’s in this deep valley that some of the world’s most esteemed wines are created, using to a large degree just 7 grapes 4 red and 3 white (23 total, most of them rare, are allowed but relatively obscure). Rousanne and Marsanne join the more widely known Viognier grapes for white wines, while Grenache, Mourvedre and Cinsault join the worldwide fame of Syrah to create the wonderful Rhone reds. Although “the Rhone” can be considered one of France’s most influential and famous wine regions, it has two very separate areas split North and South. 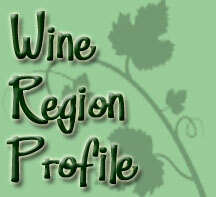 In the slim Northern section, you’ll find only the Syrah grape creating the red wines (no blends). White wines here are more esteemed, with Rousanne and Marsanne hailing a larger reputation than the also-ran Viognier (Vee-own-yay) grape which has recently caught favor on America’s west coast. Viognier is grown for a more traditional and unique reason…as a white blending grape adding complexity to the red Syrah. It is a widespread practice to add one to three percent Viognier to Syrah releases. This added layer of delicate floral and stone-fruit notes adds dramatic aromatics and contemplative depth. In the more broad area of the South, blending takes on a whole new meaning, with 23 different grapes allowed in blends that, instead, are usually comprised of “GSM” wines made from Grenache, Syrah and Mourvedre. You’ll find the true, traditional French Rhone red wines full of gritty character with spicy, meaty personalities and blissfully complex aromatics. They pair perfectly with full-flavored lean meats like venison and other game meats. Don’t expect the full-fruit extraction of California Cabernet or Australian Syrah. Fruit flavors will stand equally with the savory character, spices, and the minerality so important to culinary match-ups. Join me as I give a Wines of the Rhone Valley presentation to the local Columbia Willamette Enological Society on October 14th, 2009 in Vancouver! I’ll be serving up an assortment of 6 wines including both whites and reds to show you in detail how the areas and wines differ throughout the region, and how you can best enjoy these great French releases.